We are engaged in manufacturing and supplying a wide arcade of Boundary Walls to our esteemed clients. Offered product line comprises Precast Boundary Wall, RCC Precast Prestressed Boundary Wall and Readymade Boundary Wall. This range is constructed by making use of optimum quality raw material by employing sophisticated technology and advanced production methodologies. Moreover, patrons can avail these products from us as per their detailed specifications at market leading prices. In addition to this, we are also offer wall fencing services as per the industry laid parameters to deliver flawless range at clients’ end. 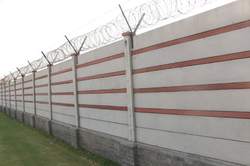 We are a leading company engaged in manufacturing an extensive range of RCC Boundary Wall. 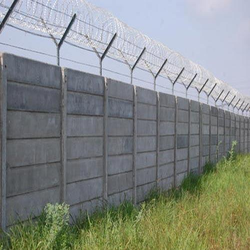 We are a leading name of this domain, engaged in offering RCC Boundary Walls to our clients. The range that we come up with is constructed under our professionals' set guidelines by making use of quality inputs and sophisticated technology in tandem with international quality standards and norms. In addition to this, we offer this range in diverse sizes along with customized options to attain maximum level of client satisfaction. 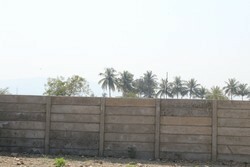 We are a coveted name of the market engaged in offering RCC Compound Boundary Walls to our deemed patrons. 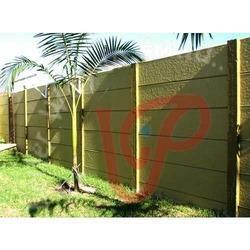 We bring forth an outstanding range of Cement Boundary Walls to our patrons. In order to deliver an outstanding range at the patrons' end, we make use of premium quality raw material that is obtained from the most affluent vendors of the industry. Patrons can avail this range in diverse sizes, grades and dimensions as per their prerequisite demands. 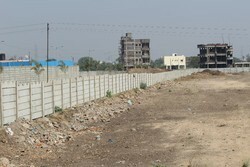 Supported by a team of diligent work force, we are instrumental in offering Prefabricated Boundary Walls. Offered range is constructed as per the detailed specifications adhered by the patrons in an efficient manner. We construct these products by utilizing supreme quality raw material in accordance with international quality standards and guidelines. 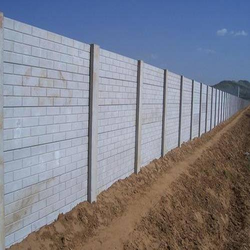 We have in store a broad assortment of Precast Prestressed Boundary Wall. These offered walls are constructed using prime quality raw material that is sourced from the most valued vendors of the industry. Moreover, this range undergoes stringent quality checks as per industry defined standards and norms. In addition to this, clients can avail this range in various sizes, grades and dimensions as per their tastes and preferences. 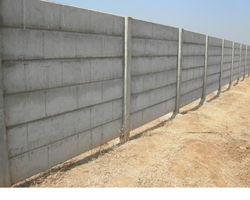 Our organization is engaged in offering optimum quality Low-Cost High Strength Concrete Boundary Wall.